Stanford is competing in the unique Gifford Collegiate tournament held at highly regarded CordeValle GC in nearby San Martin, CA, about 45 minutes from the Stanford campus. CordeValle is a top venue having recently hosted the PGA Tour's Fry's Open. The third and final round ended with Stanford in 6th place after an 11-over par 366 total counting the low five scores out of six players competing in this unique event. 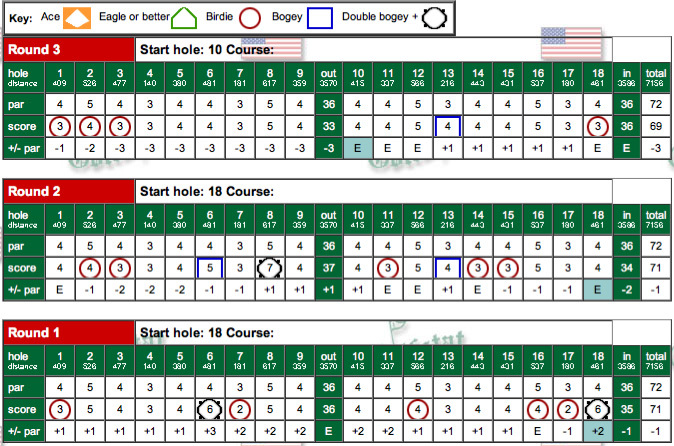 The Cardinal finished 50 shots behind the winning USC team and 46 behind 2nd place UCLA. Freshman Patrick Rodgers led the way with a 2-over total of 215 (70-73-72 T10), followed by Cameron Wilson at 216 (75-72-69 T13), Andrew Yun at 222 (73-74-75 T25), David Chung at 223 (74-75-74 T30), Shane Lebow with 231 (79-76-76 T59) and Marcel Puyat at 236 (80-79-77 67th). The overall individual winner was Steve Lim of USC with an 11-under 202 total. Playing as individuals, Steven Kearney finished at 223 (75-77-71 T30) while Andre DeDecker ended with a 231 total (78-79-74 T59). The fall tournament season has ended with Stanford returning to action on the Big Island of Hawaii Feb 1-3. The second round ended with Stanford moving up one spot to 7th with its 15-over par 370 total. The team is 44 shots behind the leading USC team, 31 behind UCLA and 19 behind 3rd place Virginia. 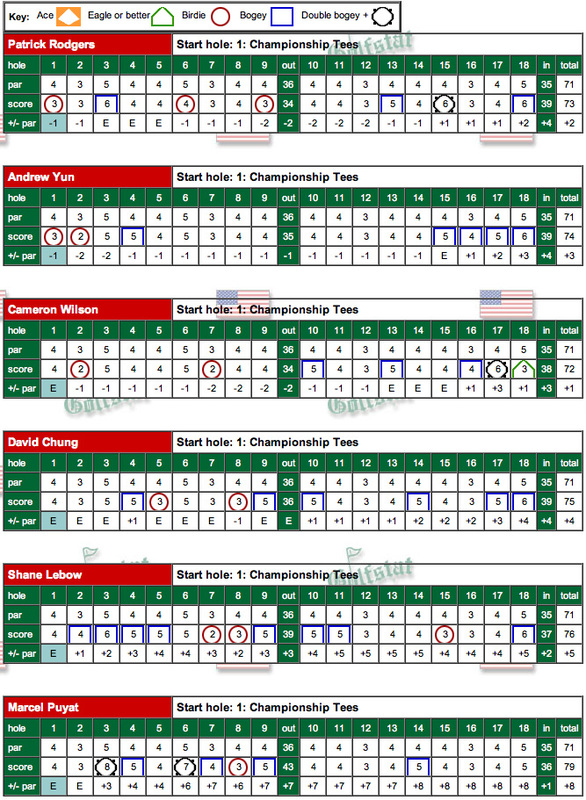 The lead individuals, Cantlay of UCLA and Lim of USC are tied with 9-under par totals of 133. 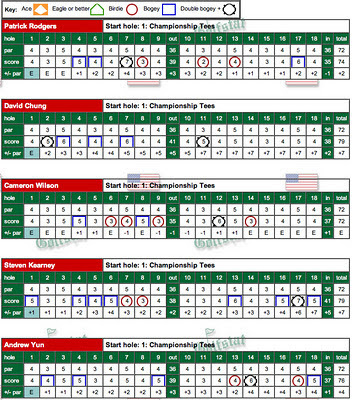 The Cardinal is led by Patrick Rodgers at 143 (70-73 T8), followed by Andrew Yun (73-74 T27) and Cameron Wilson (75-72 T27) at 147, David Chung at 149 (74-75 T37), Shane Lebow at 155 (79-76 T62) and Marcel Puyat's 159 (80-79 69th). Playing as individuals, Steven Kearney is at 152 (75-77 T47) and Andre DeDecker at 157 (78-79 T64). It was a tough first round for the 2nd ranked Cardinal team as they ended in 8th place a full 26 shots behind leading USC. On a day when scoring was low, it took a sensational comeback by freshman Patrick Rodgers to achieve his 1-under par total of 70 (T9) which was the team's only sub-par score. 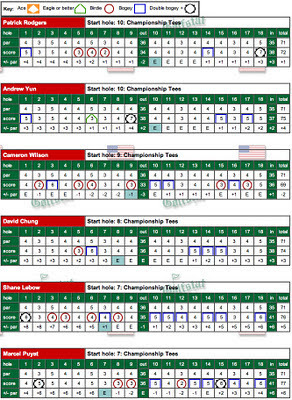 Patrick was 5-over on his first 8 holes, starting on the back nine, and he then reeled off 6 birdies on his next 10 holes, resulting in a 31 on his back nine. 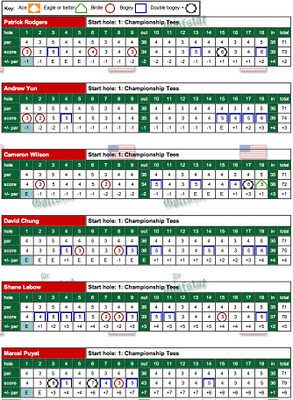 Andrew Yun was next with a 73 followed by David Chung's 74, Cameron Wilson's 75, Shane Lebow's 79 and Marcel Puyat's 80. Playing as individuals Steven Kearney had a 75 and Andre DeDecker had a 78. The individual leader was UCLA's Patrick Cantlay's 63 while USC had 3 players with rounds of 66, 68 and 68. Each team competes with 6 players, not the typical 5 players, with the low 5 scores counting each day. In addition, the Cardinal bring 2 individual competitors. Read Coach Phil Rowe's excellent summary of the qualifying for this CordeValle tourney in the coach's blog --- http://stanfordmensgolf.blogspot.com/2011/10/team-heading-to-cordevalle.html. Stanford finished 2nd to UCLA in the 2010 event at CordeValle. The tournament includes many of the nation's top teams (by GolfWeek) including #2 Oregon, #3 Stanford, #5 Washington and #11 UCLA, plus #32 USC, Arizona, Central Carolina, Long Beach State, Northwestern, Virginia and Washington State. Stanford's line-up includes Patrick Rodgers, Andrew Yun, Cameron Wilson, David Chung, Shane Lebow and Marcel Puyat and Steven Kearney and Andre DeDecker will compete as individuals. Stanford is paired with Virginia in the first round. Short practice round videos of each player are included below -- each video is very short and will automatically move to the next video. Stanford's third tournament of the season is being played in Windermere, Florida, at the highly rated Arnold Palmer-designed Isleworth GC, home to many touring pros. The tournament has become one of the premiere events always bringing together many of the nation's top teams from around the country. This year's event is no exception with Texas (#1), Stanford (#2), Alabama (#5), California (#7), North Florida (#12), Oklahoma State (#13), UCF (#15) and LSU (#18) competing along with Florida, TCU and Vanderbilt. Team rankings shown are by Golfweek. 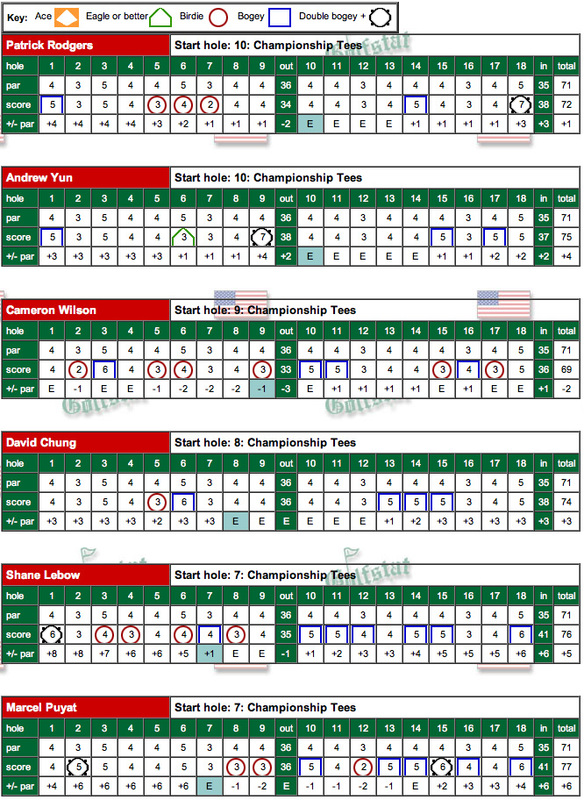 | Live scoring is being provided by GolfStat. | Pre-tourney videos by Coach Phil Rowe - see videos below. Thanks to Elise Chung for providing excellent photos of the event (see sample below) --- https://picasaweb.google.com/cechung/Isleworth2011?feat=email. Final Results - Stanford finished a disappointing 7th a full 45 shots behind the hot Texas team despite having three individuals finishing in the top 10. 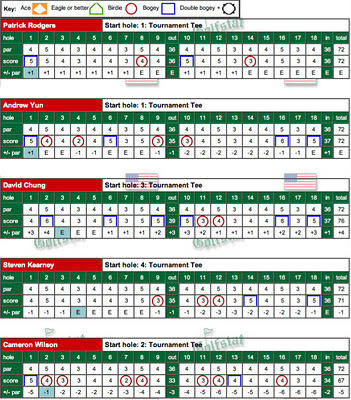 Nine strokes separated the 2nd thru 7th teams. The 3rd and final round total of 301 was the worst of the three days of play (291-299-301) as the Cardinal had no players breaking par. 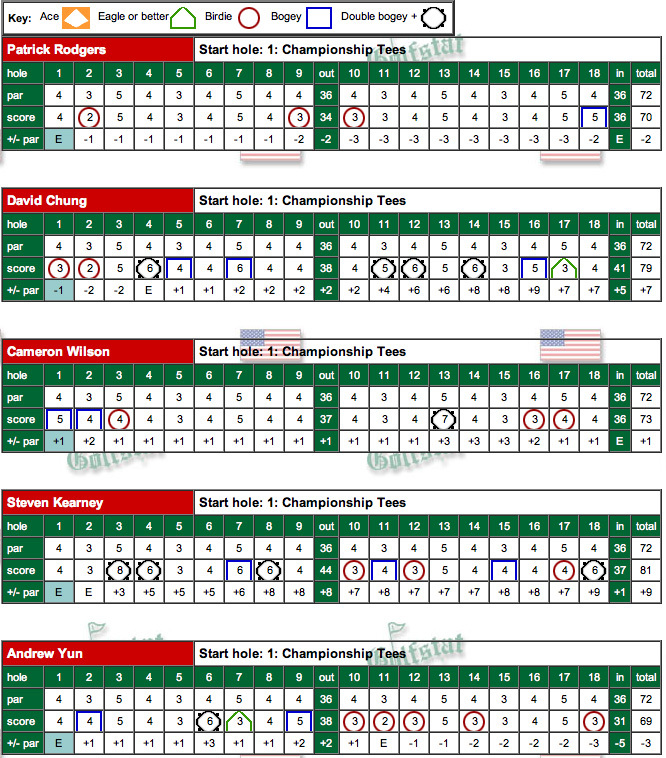 Patrick Rodgers finished 4th overall (70-72-74 216), Andrew Yun finished tied for 6th (69-73-76 218), Cameron Wilson was tied for 10th (73-75-72), David Chung tied for 59th (79-79-79) and Steven Kearney tied for 68th (81-82-79). The runaway individual winner was Jordan Spieth of Texas with an 11-under par 205 total. The final tournament of the fall season starts Oct 31 at Cordevalle GC near Stanford, a course that recently hosted a PGA tour event. Round Two Results - Stanford stands in 4th place after two rounds after an 11-over par 299, leaving the team 16 shots behind Texas, 6 behind LSU and 3 behind North Florida. Scores were higher in the 2nd round, likely due to windy conditions. Andrew Yun (69-73) and Patrick Rodgers (70-72) are tied for 2nd individually at 2-under par, 4 shots behind Jordan Spieth (65-73) of Texas. Round One Results - Stanford finished tied with Alabama for 3rd after the first round, 13 strokes behind Texas and 4 behind North Florida. 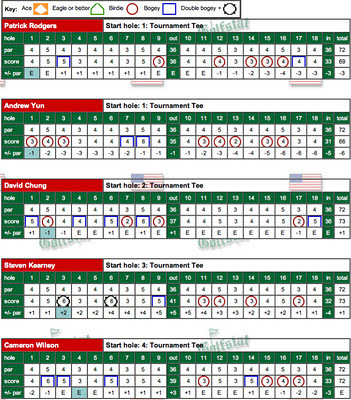 The Cardinal was led by Andrew Yun with a 3-under par 69, followed by Patrick Rodgers at 70, Cameron Wilson with 73, David Chung with 79 and Steven Kearney with 81. Patrick is tied for 2nd individually 4 shots behind Texas' Jordan Spieth, while Patrick is tied for 5th. Andrew's round was marked by a sterling 5-under par back nine 31 while Patrick's steady round included 3 birdies and a lone bogie. Stanford finished 3rd, 8 strokes behind Oregon and 6 behind Washington in a low-scoring shootout in the Palm Spring area desert. Played at the Greg Norman Course at PGA West, the Prestige had the nation's top two teams facing off in the Cardinal and Oregon. A solid final round 10 under par 278, the day's 3rd best round, was not enough to catch Oregon which had built a 10 stroke lead after the second round. 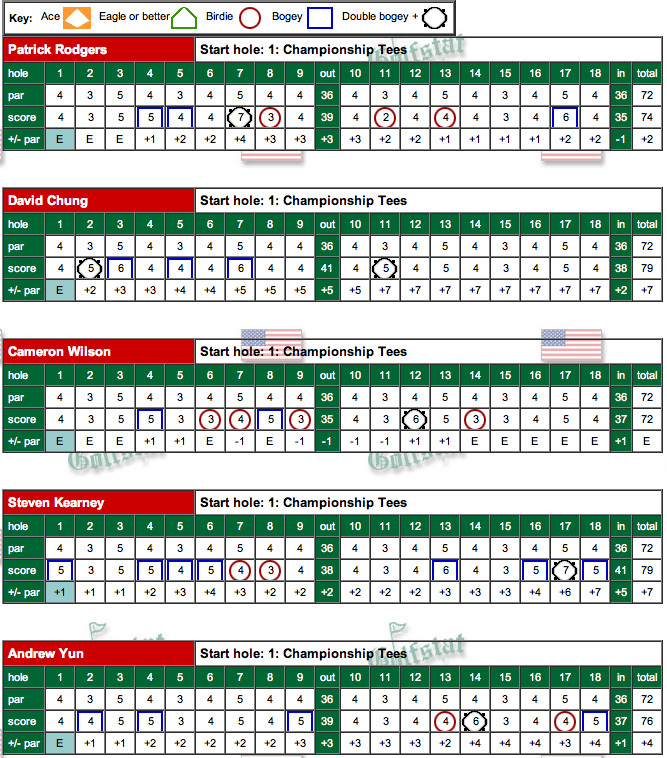 In the final round, Patrick Rodgers and David Chung led the way with matching 68s, Steven Kearney had a 70, Andrew Yun a 72 and Cameron Wilson a 74. 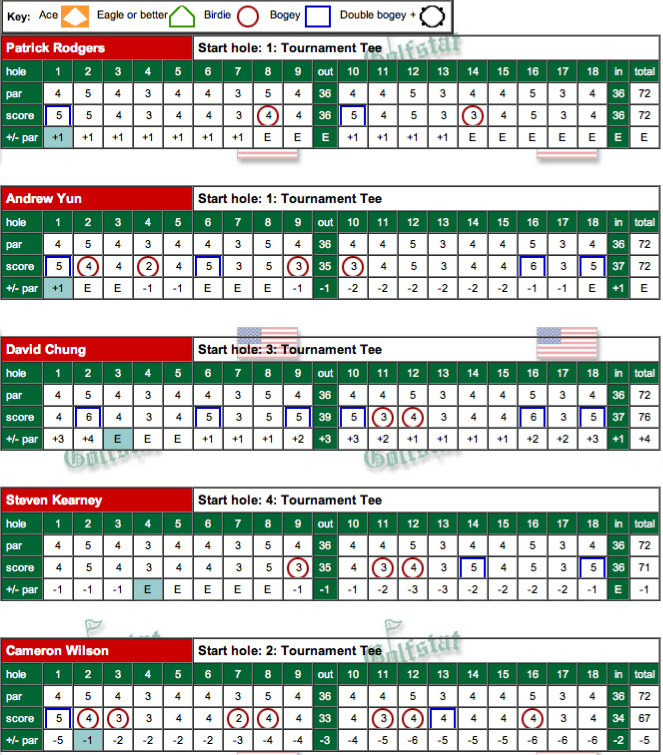 Three round totals were Rodgers 209 (69-72-68 T10), Yun 210 (66-72-72 T14), Cameron Wilson 213 (72-67-74 T24), Steven Kearney 214 (73-71-70 T26) and David Chung 217 (73-76-68 T39). Playing as individuals, Marcel Puyat, from nearby Indio, had a fine tournament with rounds of 71-71-69 for a 211 total to finish T17 and Andre DeDecker had a 225 total on rounds of 77-73-75 to finish T67. "I thought we played pretty well," said Ray. "Oregon has a really good team this year as does Washington and it just wasn't our week this week. 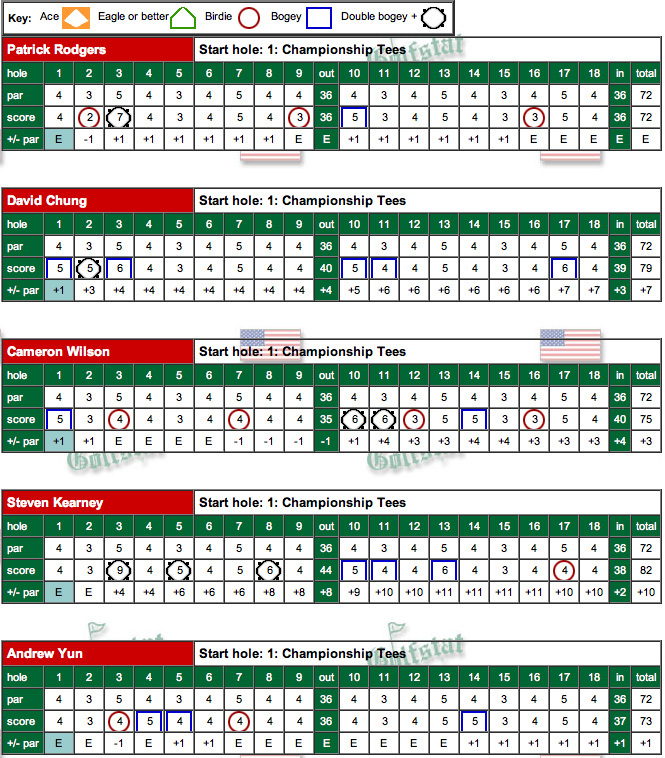 We had some bright spots - it was nice to see David Chung put up a good round today and Patrick Rodgers had another top-10." "We have high hopes for Marcel," said Ray. "He's hitting it well and he's got a good short game that he really works at. I see nothing but upside for Marcel; he's going to help us before the season's out. We have a bunch of guys who can play and we have a deep team this year and that's always a good thing in college golf." Stanford shot a steady second round total of 282 (6-under par) but found itself 10 shots behind as it was passed by three teams going very low, led by Oregon's 15-under par total of 273. 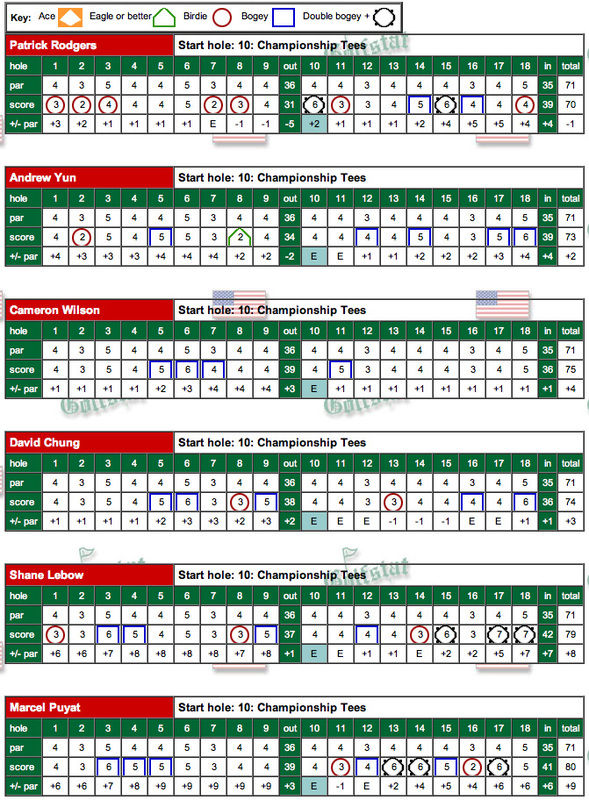 Scoring conditions allowed Oregon, Washington and San Diego State to each post 4 under par rounds. 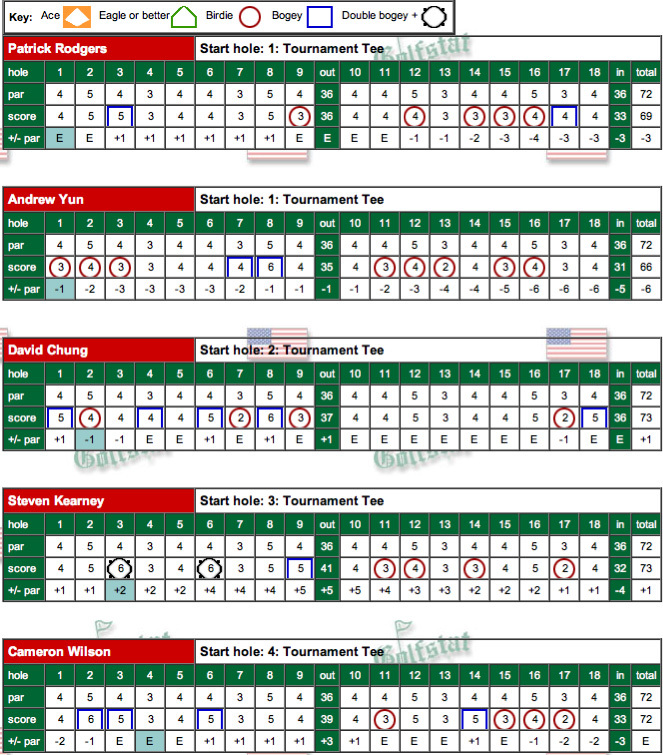 The Cardinal was led in the second round by Cameron Wilson's 5-under 67 (72-67), followed by Steven Kearney's 71 (73-71), 72s from Andrew Yun (66-72) and Patrick Rodgers (69-72) and a 76 from David Chung (73-76). 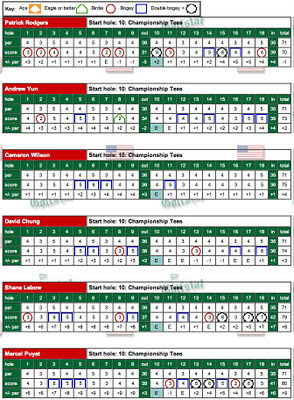 Cameron's round included 7 birdies. Playing as individuals, Marcel Puyat again played well with a 71 (71-71) and Andre DeDecker had a 73 (77-73). La Quinta, Calif - Stanford shot an opening round 280 in the opening round at The Prestige at PGA West held at the Greg Norman Course. 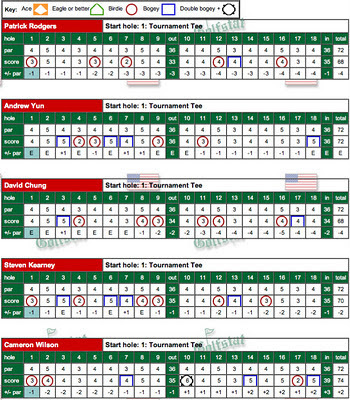 Stanford got off to a slow start but was able to move up the leaderboard on the back nine. The Cardinal, ranked first in the country by Golfweek, is one stroke behind No. 2 Oregon for the team lead. 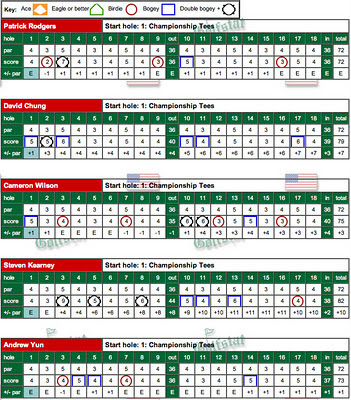 Defending champion Andrew Yun fired a 66 (-6), good for a share of first place with Arizona State's Spencer Fletcher, after making five birdies on the back nine. Patrick Rodgers had a 69 after going three-under on the back nine and is tied for eighth place, three strokes back. Knowles Family Director of Men's Golf Conrad Ray was impressed by Yun's play. "Andrew had a stellar back nine and looked great all the way around," he said. "His game is solid and he's feeling really good about how he's playing this year." 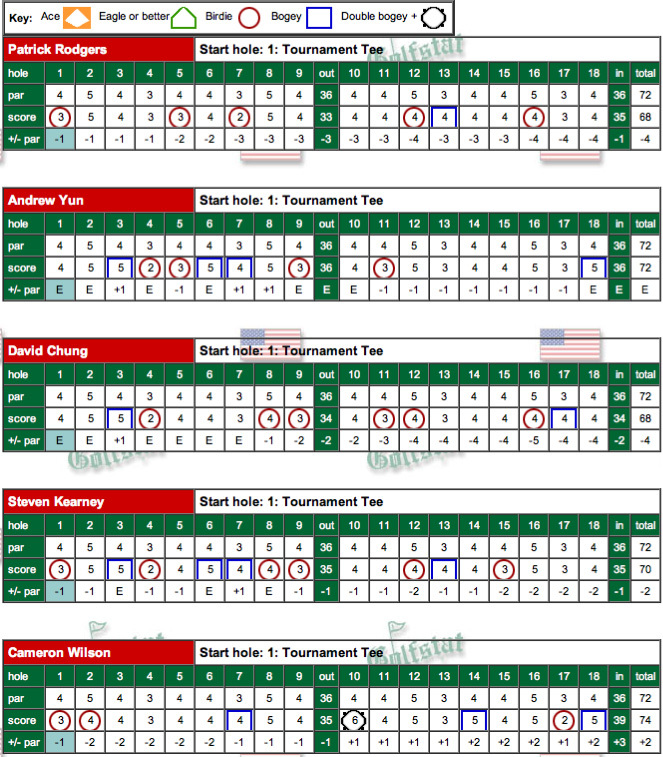 Cameron Wilson (72), David Chung (73) and Steve Kearney (73) carded solid rounds for the Cardinal. "I feel pretty good about how we played," said Ray. "Steve got off to a slow start and finished strong and everyone contributed. We have some work left and we're going to have to play well the rest of the tournament." Freshman Marcel Puyat had a fine 71 and Andre DeDecker a 77 while competing as individuals. GoStanford.com story.